Upgrade Existing Sash Windows. 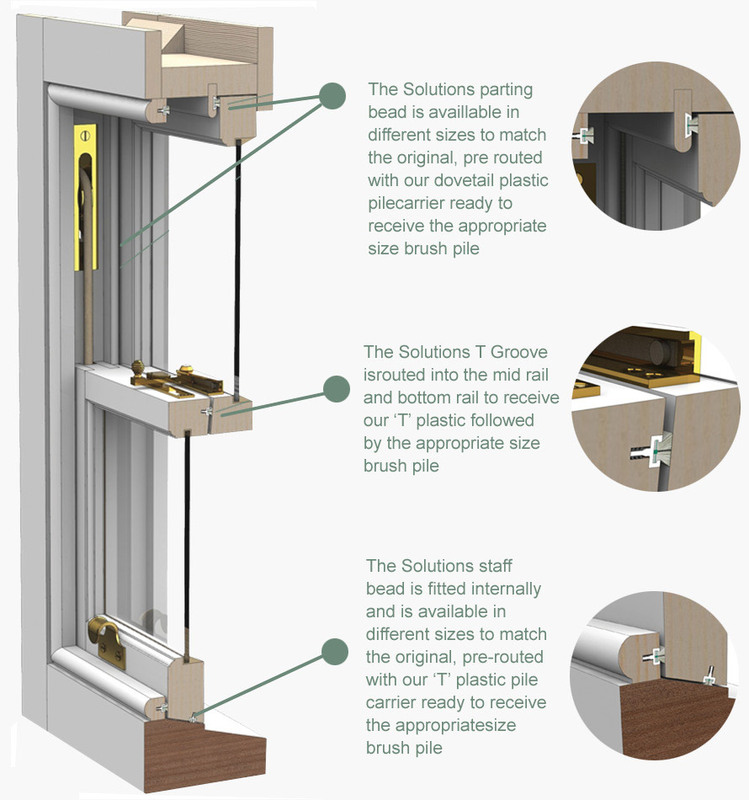 Our unique Solutions Brush Pile System™ is a means of eliminating the problems associated with traditional sash windows. Once the only option was plastic replacement windows, but our Solutions Brush Pile System™ offers a real alternative. NOTE – We do not use double sided taped extrusions to carry our brush piles as they do not stand the test of time. We do not use plastic parting beads as they can have an enormous effect on the appearance of traditional period windows. 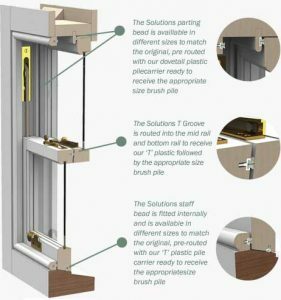 Whenever we upgrade existing sash windows all of the products contained in the Solutions Brush Pile System™ are our own proud design registered products which are exclusive to Sliding Sash Solutions and are not retailed. • Each sash window is carefully dismantled and existing staff beads, parting beads and sash cords are removed and discarded. • Top and bottom sashes are eased and adjusted as necessary and glazing bars/mid-rails are realigned. • The Solutions Brush Pile System is installed to the new staff and parting beads and the mid and bottom rails of the bottom sash. • Sash cords are replaced with traditional style waxed cotton cord with a polyester core for extra strength. • Sashes are re-weighted/rebalanced as necessary. • Existing ironmongery is re-aligned (if in good working condition), or replaced if required with high quality period style ironmongery available in several different finishes.